One Big Yodel: Is Swiss Transportation too good? The Swiss train will bring you to the bus that brings you to the cable car that brings you to that beautiful meadow in the middle of nowhere. Amazing. And all connections will have minimal waiting time. But is this minimal connection time really ideal? Of course, if you've just got yourself to worry about, five minutes to go from track 54 to track 18 is no big deal. But add a few pieces of luggage, a stroller the size of an SUV, or a group of clueless visitors trailing behind you, and you're just setting yourself up for a world of pain. The Swiss senior citizens, though, are the champions at tight connection times-probably because they have hiking poles to push through the crowds with. We should all get some of those. They seem effective. In fact, my mother-in-law actually stopped a Swiss train dead in its tracks with a hiking pole. Talk about power. What do you think about Swiss public transport? On one hand, it's wonderful. On the other hand, I'm out of breath. 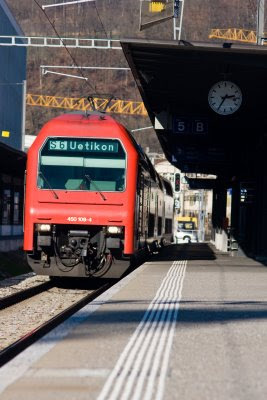 Read more at "Swiss Transportation: Almost too good?" on glimpse.org. Those flowers in Montreux look amazing. Looks like a road trip this weekend for me! Yes, you should really go to Montreux. According to a local there, you should park the car though and go on a hike--it's the only way you'll run into the flowers as I guess you can't really see them from the main road up the mountain. I feel like I spend my life running to catch trains. Seriously. I think having those hiking poles would have helped me out on numerous occasions. :-) I can no longer count the number of times I've run to catch a train only to get there, push the button, and have it be 2 seconds too late. There is no simple way to answer this question. I guess that's what this blog is for. There are goods and bads in both places and both seem to become more pronounced after living out of your comfort zone.